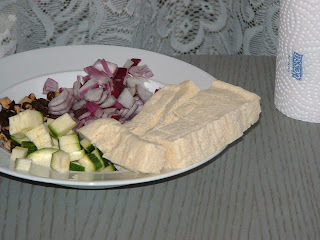 Have any of you tried to freeze tofu before? If so, this probably won't be so interesting to you. I'd heard that freezing tofu changes its texture, so I thought I'd give it a try. I also knew that it would take on a yellow-ish hue. 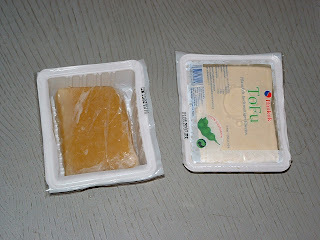 But this is terrifying; on the right, the unopened tofu package, on the left, straight out of my freezer. It's caramel colored! Once defrosted, it looks more tofu like (thankfully) with a spongy texture. whoa - I had no idea... weird.